Kurt Nielsen is on a strange assignment, especially for a public employee. As the manager of the Lighting Design Lab, which is a spinoff of Seattle's power company, he has been tasked with finding energy-efficient lights for the growing of marijuana. Most of the country's legal cannabis farming, in Washington and Colorado, is happening indoors and under scorching-hot lights. Washington state has issued licenses for the cultivation of 1.2 million square feet of cannabis "canopy," as it's called, since voters approved its production and sale for recreational purposes two years ago. But neither state has given much thought to where the energy will come from. Nielsen has been looking for a while now and declared that the efficiency quest is "a wild goose hunt." "This has become a major issue with most of the regional utilities, now that we have legalized the recreational use of cannabis in this state. There is a huge new industry that's popping up, grow operations. They're getting as much as 200 watts per square foot of lighting power density, which is astronomical," he said. "How are they going to handle and manage this industry?" Utilities and energy officials in Washington and Colorado indicate they are deeply worried about serving their new set of energy-intense customers while not running afoul of federal drug laws. The intertwined relationships between state and federal governments mean that acting to lower marijuana's energy usage could endanger millions of dollars in federal grants or electricity deliveries from federal hydroelectric dams. LEDs have the promise of being excellent grow lights, because they can be fine-tuned to exactly the slices of the light spectrum that plants enjoy, like ultraviolet (which grows lots of vegetation) and infrared (which stimulates flowering). Photo courtesy of the Growers Guide to Cannabis. As a result, utilities find themselves planning in stealth for what is shaping up to be a major power consumer that is as hungry for electricity as corporate data centers, according to a study published in the journal Energy Policy. Some publicly funded utilities are in a state of paralysis, fearful of offering growers the most innocent of overtures -- the energy-efficiency rebate. With ballot initiatives to make recreational pot legal on the ballot this November in Alaska, Oregon and Washington, D.C., the clash between federal and state laws is heating up. Last week, the four senators from Colorado and Washington sent a letter to Attorney General Eric Holder and White House Chief of Staff Denis McDonough asking for the government to clarify its sometimes-contradictory marijuana policy. "What we're struggling with is what everyone is struggling with, which is that the federal government is treating marijuana as a Schedule I illegal drug in the same class as heroin and that sort of thing," said Eric Christensen, a lawyer for several of Washington state's public utility districts. "On the other hand, the state law basically declared marijuana to be a legal drug, albeit highly regulated. The question is how you rationalize the two, when they're going in 180-degree opposite directions." How many electrons go to grow pot? Numbers from Colorado's largest utility indicate that about one in every 200 watts it sells is being fed to marijuana grow operations. In Washington state, where legal pot farming is being rolled out more slowly, utilities don't yet have estimates. But unofficial projections are still substantial. Gabriel Romero, spokesman for Xcel Energy Inc., the major electricity provider in Colorado, wrote in an email, "We are in the process of beginning to track state licensed facilities in the marijuana industry and have roughly estimated that the industry's total energy use is 150-200 [gigawatt-hours] per year, or about ½ of 1 percent of our total annual electric sales." Xcel serves 60 percent of Colorado's electricity customers, including Denver, where warehouses emptied out by the Great Recession have become ground zero for marijuana farms. Some smaller growers have switched on their grow lights and blown the transformers out, Romero said. It's hard to tell how much energy Colorado growers are using because the state doesn't track the size of its grow ops. Since December, it has licensed 279 recreational cultivators, according to the Marijuana Enforcement Division of the state Department of Revenue. The members of the Colorado Public Utilities Commission declined to comment for this story. 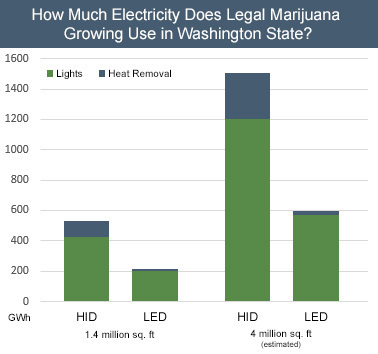 This graph projects the electricity needs of cannabis cultivation in Washington state, comparing the use of high-intensity discharge lights (HID) versus light-emitting diodes (LED). Green is the electricity used to power lights; blue is the electricity used by fans and air conditioners to remove heat. Further, it compares the current square footage of legal marijuana canopy (1.4 million square feet) versus a conservative estimate of how much canopy it will grow in the future (4 million square feet). Data courtesy of Lighting Science Group. In Washington state, the Liquor Control Board has since March issued licenses to 155 growers, for a total of 1.5 million square feet of canopy. The initial goal is 2 million square feet, at which point the board will evaluate how much more is needed, said spokesman Brian Smith. Of those licensees, 84 say they intend to grow indoors and 54 outdoors, according to board records. Most indoor growers rely on bulbs that each use a whopping 1,000 watts or more, such as high-pressure sodium, high-intensity discharge or metal halide bulbs. They throw off prodigious heat that must be removed with fans and air conditioners, which require yet more energy. The more efficient -- and cooler -- alternatives are fluorescent bulbs, which are only useful for part of the grow cycle, or light-emitting diodes (LEDs), which are expensive and whose growing properties are little known. How much energy are Washington state's pot farmers using, and how much will they use as the industry matures? The Lighting Science Group, a maker of LED bulbs for the marijuana industry, ran some projections for this story. The projections posed several scenarios. For example, they compared the energy usage if every grower used high-intensity discharge lights versus using LEDs, and also factored in the energy needed to remove the heat created by the lights. Also, they compared the current square footage of marijuana canopy (a slightly outdated number of 1,415,000 square feet) versus a conservative estimate of how much cannabis Washington state might eventually grow (4 million square feet). The most startling numbers: If Washington state doubles its initial square footage of cultivated marijuana, and uses the standard high-intensity lights common to growers, it will use 1,505.6 GWh of electricity a year. If it switched entirely to LEDs, it would use 597.9 GWh. Washington state used a total of 92,336.4 GWh of electricity in 2012, the latest year for which figures are available. If those future growers use LED lights, that's 0.65 percent of the state's total energy usage. If they use high-energy lights, it's 1.63 percent of the state total. "When you do run the numbers, it's quite staggering," said Kathleen Sullivan, whose company, Forever Green Indoors, sells Lighting Science's bulbs in Washington. "Wow," said David Danner, the chairman of the Washington state Utilities and Transportation Commission, upon hearing some of the energy projections. "I don't think I can comment on that." The Snohomish County Public Utilities District (PUD) serves much of Puget Sound north of Seattle. The nation's 12th-largest publicly owned utility, it would like to offer incentives for efficient lights to its two legal growers. But it can't take the risk. The reasons why are a window into how snarled the issue has become for utilities and other agencies that now count cannabis farmers as customers. Providing a cash rebate to marijuana growers would throw into jeopardy the grants the state receives that have nothing to do with cannabis, including ones for tidal and geothermal energy, as well as smart-grid and energy-efficiency programs, said Neil Neroutsos, the utility's spokesman. Since 2010, it has received $29 million in federal dollars. "What we're looking at is the issue of these contracts," said Neroutsos. "We want to make sure we're not in violation of any regulations in relation to those grants." To further complicate matters, Snohomish PUD doesn't want to run afoul of the Bonneville Power Administration (BPA), a federal agency that supplies about 80 percent of its electricity. BPA operates 31 hydroelectric dams in the Columbia River Basin and provides about a third of all power to the Pacific Northwest, including most public utilities. "We are only beginning to look at the potential grid impacts and are not prepared to discuss those issues at this time," BPA spokesman Joel Scruggs wrote in an email. "We are also currently exploring issues related to supplying power and other services to customers serving marijuana grow operations. Again, it is too early to discuss the potential policy implications or details of those discussions." One class of power companies is already offering rebates of as much as hundreds of thousands of dollars to marijuana growers. They are investor-owned utilities, which fund their rebates from fees on their own customers, rather than from the government. In Washington state, two utilities, Puget Sound Energy and Avista, have already offered substantial rebates to pot growers. Avista, which supplies power to much of eastern Washington, recently gave a marijuana grower a rebate of almost $163,000, or $291 per light, for switching from high-intensity lights to LEDs, according to Sullivan, whose company arranged the deal. Avista wouldn't confirm the rebate but did not dispute the numbers. And in Colorado, Xcel, which is also investor-owned, has given rebates to several growers, though it won't say for how much or to whom. Earlier this year, it became the first utility to publicly announce it would provide such rebates (EnergyWire, April 1). The confusion extends to water, which marijuana plants also need in abundance. Much of the water in both Colorado and Washington state is provided by dams run by the Bureau of Reclamation, another arm of the U.S. government. In May, the Bureau of Reclamation issued a policy saying it would tell the Department of Justice if any water agency specifically notified the bureau it was serving marijuana growers. Christensen, the lawyer for public utility districts, said the message the federal water agency was sending to state water officials was, "Please don't tell us, we really don't want to have to deal with this." Then there's the issue of how marijuana growers pay their power bills, which can amount to tens of thousands of dollars per month. "So far the growers have had a hard time finding any financial institutions who are willing to deal with them, so you can imagine a situation where a grower shows up to pay his electric bill with piles of cash," Christensen said. In terms of these sort of transactions, he added, federal law enforcement so far makes no distinction between "a Colombian drug lord or a marijuana farmer in Wenatchee." Nielsen, the Seattle lighting specialist, has a reliable way of finding what kind of energy-efficient lights might qualify for a rebate. He checks out the publications of the DesignLights Consortium, which utility officials across the country rely on for standards. But the consortium has no standard for marijuana grow lights. In fact, it has no standards for any form of horticultural lights, not even lettuce or tomatoes. Until recently, there has been no demand for such a thing. 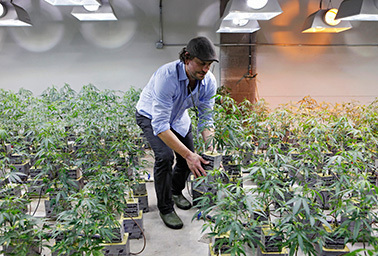 Matthew Huron, owner of two medical marijuana dispensaries and an edible marijuana company in Denver, examines a marijuana plant in his grow house. Most of the country's legal cannabis farming, in Washington and Colorado, is happening indoors and under scorching-hot lights. Photo by Ed Andrieski, courtesy of AP Images. Growers, too, are looking for this kind of guidance. As marijuana has started to become legal, vendors of LED grow lights have popped up like weeds after a rain. Efficient, cool LEDs are a grower's best chance to lower the power bill. Yet no one knows what a good LED bulb is for growing cannabis. "Because there have been no studies, what everyone says is anecdotal," said Joe Rammell, a grower in Washington state who has also founded PotLight, his own LED lighting company. "It'd be nice if one of these places could come up with some data." It's a difficult question to answer, for a basic reason: Plants aren't humans. "For us, one of our rules for getting rebates is that the product must be on a qualified product list to be eligible for funding," said Peter Meyer, the commercial-industrial conservation manager for Tacoma Power, a Washington state utility. "The metrics that have been developed so far has been for products that relate to humans and eyesight. They aren't developed for plant growth and efficiency for plant growth." The yardsticks are entirely different. Lighting for humans is measured in lumens, while illumination for plants is measured in micromoles. LEDs have the promise of being excellent grow lights, because they can be fine-tuned to exactly the slices of the light spectrum that plants enjoy, like ultraviolet (which grows lots of vegetation) and infrared (which stimulates flowering). It's the combination of these two hues -- purplish and reddish -- that gives some LED grow lights an intense purple glow. Yet, despite their promise, research on LEDs and plant growth is nearly absent. 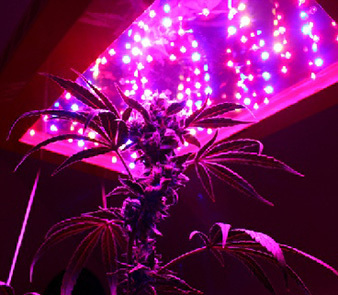 "We don't know how plants respond to the unusual colors of light that come from light-emitting diodes," said Bruce Bugbee, a crop professor at Utah State University who authored a study published in PLOS ONE on the properties of indoor grow lights. Standards for efficient agricultural lights are coming, and not just for marijuana. D&R International Ltd., a Maryland company that develops lighting standards, is starting to establish metrics for LED lights for plants, as well as chicken and cow barns. Emily Phan-Gruber, the project coordinator, said demand is coming from utilities, which have already wrung the easy energy savings from office buildings and see agriculture as a promising new area for more efficient lighting. But marijuana growers in Washington and Colorado don't want just any grow light; they want one that's optimized to their very sought-after and peculiar crop, one where the goal is extraordinarily dense clusters of buds, encrusted by crystals of tetrahydrocannabinol, or THC. It's the THC that gives pot users the high. It is in the search for such a light that Nielsen has run up against a dead end. Normally he would turn for advice to someone like Steve Newman, a greenhouse-crops specialist at Colorado State University. After all, Colorado State has the biggest horticulture program in the first state to legalize recreational marijuana. But Newman, like researchers at most universities with federal funding, says he can't get anywhere near a marijuana plant. Growers in Colorado also want his botanical knowledge, not to mention his students, who are being offered kingly salaries by the state's new pot industry. "As long as cannabis production is a federal offense, we have been instructed not to fool with it," he said, citing his department's policy on the matter. "It's way too gray for us to do any work." LEDs are also expensive: A lighting module costs $1,350, as opposed to $450 for a high-pressure sodium light, Sullivan said. The LEDs last many times longer. Because lighting is a grower's biggest expense, the price tag keeps indoor farmers away. "I think there's a lot of potential with LEDs, and if I could get the same production, I would go with LEDs. Unfortunately, they're very expensive lights, and I'm not sure they've proved their worth yet," said Brent Reeh, a novice Washington grower. As for reducing the energy consumption of marijuana, many sources pointed to one tried-and-tested solution: greenhouses. Illegal, indoor pot farmers have become accustomed to running their grows on a more precise schedule than the sun and clouds allow. But a new generation of greenhouses are emerging that use light meters and turn the lights up when a cloud blocks the sun. In Colorado, which according to the Colorado Climate Center gets 245 sunny or partially sunny days a year, several marijuana greenhouses have appeared around Boulder and Pueblo, according to Ryan Ryall, a Colorado salesman for Lighting Science Group. Fifteen legal farmers in Washington intend to grow in greenhouses, according to state records. It's possible that legalization will hurry along more energy-efficient growing. "Moving from an underground market to a legal, regulated market is one of the best things that could happen for energy efficiency," said Taylor West, a spokeswoman for the National Cannabis Industry Association. "You allow innovators to really invest in their products and look for the best way to do things, in a way that you just don't have when people need to keep their operations completely hidden." The federal government's rigid posture toward the marijuana industry is showing tiny signs of relaxing. In February, a measure folded into the farm bill permitted research into industrial hemp, which is a form of marijuana that has only tiny traces of the intoxicant THC. Meanwhile, the "Respect State Marijuana Laws Act," introduced in the House of Representatives last year, appears to be gaining little traction. It would give the federal nod to the growing, cultivation or sale of marijuana if those were made legal in a state. Energy officials in Washington and Colorado are the first to have to wrap their minds around the connection between electricity and marijuana. For many, it's a really weird trip. "A few months ago, I took a tour of a growing operation," recalled Nielsen, the Seattle lighting specialist. "It was very interesting, but I was going, 'I can't believe I'm here, I can't believe I'm walking through and being asked to do this as part of my job.'" Correction: An earlier version of this story misstated the costs of LED and high-pressure sodium grow lights.